How to Maintain Terracotta Tile – Mees Distributors, Inc. 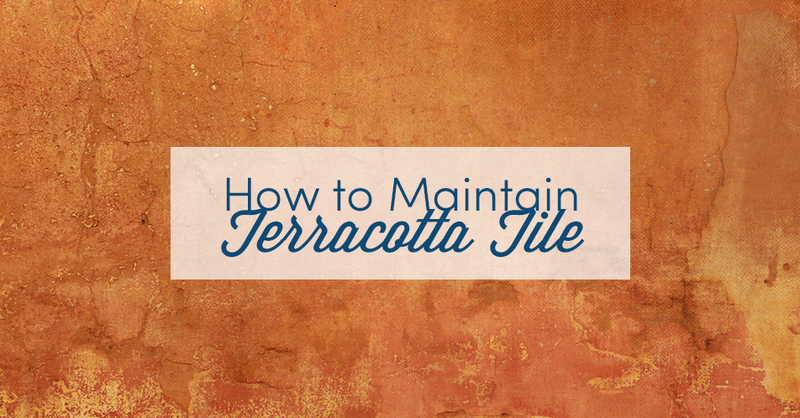 If you have or plan to install terracotta tiles on your floor, you need to know how best to maintain them. Terracotta performs much like natural stone or concrete but with the exquisite charm of man-made, kiln-fired clay tile. If you install natural terracotta, which has a rough surface, you should have it professionally sealed. The clay is quite absorbent and will easily stain from liquid spills. Although sealing the tile will slightly darken it, the seal will prevent rapid wear and most stains if you respond quickly to a spill. Glazed terracotta comes with a high gloss factory finish and only requires a topcoat sealer of wax to sacrifice to foot traffic. Otherwise, for both types, you should remember the following tips to prevent damage and disappointment. To keep outside dirt from tracking in on shoes then scratching and gouging the floor, use mats at all the entryways into the home. Be sure to shake out and wash them often. Carpet runners on high traffic paths cut down on the wear, as well. Pulling out and scooting in on chairs will leave scratches, so chairs should have casters for easy rolling. Stools, table legs, and furniture should be fitted with soft floor protectors. If you wouldn’t drag an item across a wood floor, you shouldn’t do it across terracotta, either. Make sure you place mats under metal items to avoid rust spots on the floor. Simple felt, cork or grippy shelf liner cut to size will put enough distance between metal and the floor to block rust stains. The need to use proper cleaning products can’t be overstated. Never use common grocery store cleaners, bleach, ammonia or abrasives on your terracotta as they’re too harsh and likely will have an incorrect pH balance. You must invest in professional grade products such as those sold by Mees Distributors, Inc. Improper cleaners can dissolve the top coating and discolor your tile and grout. The right cleaners will enable a thorough clean-up without disturbing any of the finishing layers. Even though glazed terracotta resists common cleaners better, you shouldn’t take the chance. Simply keeping dirt off the floor goes a long way towards maintaining your terracotta. Rather than allowing dust and debris to pile up, broom sweep, dust mop or run the vacuum cleaner more often. When mopping, it’s best to mix your cleaner and water in a spray bottle and spritz so not to oversaturate the floor. Spray one area at a time, allow to sit for about half a minute, agitate with a soft mop or sponge, then wet-vacuum or mop up the solution. Rinse with clean water in the same way. At Mees Distributors, Inc., we want your floors to last a lifetime. Call us with any other further questions on how to maintain your floors! Our technicians will help you choose the right products to keep your terracotta in good shape for years to come.